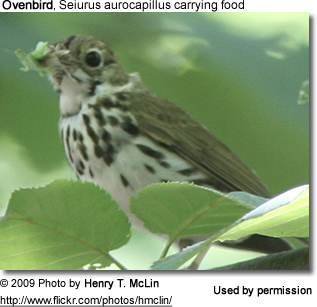 The Ovenbirds, Seiurus aurocapillus, are small, thrushlike songbirds found in Mexico, and Central and South America. They were named for their leaf-covered dome nests that resemble outdoor ovens. They are also commonly referred to as el horneros ( house builders) as they use clay or mud mixed with fibers or hair to construct their nests. 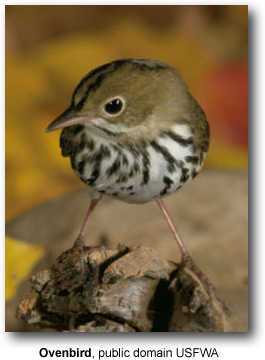 Ovenbirds are somewhat smaller than Song Sparrows; they average 14 cm in length and weigh about 18 grams. Below they are white with black streaks. Above they are olive-brown.There are orange lines on the top of their crowns, with dark brown borders on the sides. 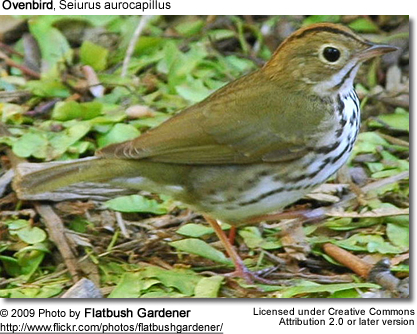 These birds have conspicuous white eye rings, flesh-colored legs and thin pointed bills. Diet consists of insects, spiders and snails. In winter, they also take fruit. Prey is taken from the ground or caught in mid-air. The nest is a domed structure with a side entrance. 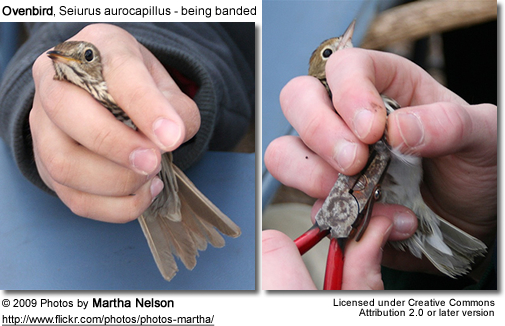 The nest is also referred to as "Oven" (hence this species' common name). It is woven from vegetation and placed on the ground. Both parents feed and protect the chicks. Genus Pseudasthenes – "false canasteros"